Today's patients expect healthcare experiences that rival the consumer arena’s best-of-breed experiences, with systems that support technology like remote consultations, constant connectivity and location-aware mobile services. As part of this, clinicians need the ability to deliver better care at the patient's bedside in a secure digital environment, with access to information from any location, at any time. In 2019, more information will be shared through mobile devices than ever before. To survive in this fast-changing world, healthcare may need to evolve. "This transformation means healthcare organizations will need to focus on more mobile and connected technologies across the continuum of care," said Barbara Casey, director of healthcare and life science at Cisco. "Mobile solutions are no longer just add-ons for convenience, but essential tools for improving the patient experience and streamlining the clinical experience." Next-generation contact center and patient engagement tools can facilitate the right kind of environment that makes it easy for patients to schedule appointments, find their way within a hospital, and stay connected with loved ones while receiving treatment, she said. These capabilities are made possible through the deployment of a platform of architectures that enable new capabilities for healthcare providers such as remote monitoring solutions, patient tracking, clinical mobility, guest wireless and location-based services, she said. This connected environment creates a less stressful and more comfortable space for patients, she added. "The other key aspect of the changing healthcare landscape is how clinicians are able to leverage data and technology," Casey stated. "Communication and workflow coordination among care teams can make a significant difference in the patients' quality of care and experience. By streamlining clinician processes through the use of collaboration and mobile technology, caregivers can be more effective and efficient – improving clinician productivity, patient care and the bottom line." "Understand holistically what the foundational technologies are that need to be in place to implement the organization's strategic initiatives and respective business strategies." With clinical mobility and improved collaboration, clinicians will be able to streamline care management and care-team communication, expand telehealth services, and save time and money finding medical equipment, she added. "This was just one reason why Cisco partnered with Apple," she explained. "Apple and Cisco have co-engineered solutions ensuring iOS devices perform better on a Cisco network. Additionally, iOS-based applications can be prioritized on the network ensuring iOS-based mobile clinical workflows from Cisco solution partners like Mobile Heartbeat and PatientSafe Solutions perform without network interruption or risk of disconnection from the network." While digitization, the cloud and the Internet of Things bring many benefits to healthcare organizations and patients alike, they also bring challenges and disruption. This year, the exchange of data will be at an all-time high, fueling an influx of patient experience metrics, virtual care opportunities and a growth in artificial intelligence. "Tech-savvy consumers, a proliferation of medical and consumer devices like wearables, an explosion of data, and government regulations are rapidly transforming the world of medicine," Casey said. "As wearables and connected devices make their way into regular practice, doctors, nurses and other practitioners are turning increasingly to mobile devices and big data to improve patient care and boost efficiency." As these mobile innovations move from the pilot phase to scale, healthcare organizations will need to keep in mind the challenge of data overload and meeting patient expectations, she added. For example, one Cisco customer manages 26-44 petabytes of data from EHRs alone; for another customer, the amount of data they manage grows by a rate of 50 terabytes every month, she said. "Add to these challenges the critical need for security – physical and virtual – for facilities, people, devices and government regulatory requirements," she said. "The role of mobile technology is important for improving the patient and clinician experience, but how those mobile devices affect the management and security of data must be considered." This means the role of the healthcare CIO will need to become even more strategic and take on more leadership within their organization, especially as data shifts to the cloud in the next few years, she said. "The biggest advice we can provide to healthcare executives from both a business and technology perspective is to understand holistically what the foundational technologies are that need to be in place to implement the organization's strategic initiatives and respective business strategies," Casey advised. Be realistic about one's current state of technology capability, she added. Using tools such as HIMSS Analytics new Infrastructure Adoption Model helps with third-party validation, she said. "Seek to understand the line of business perspective and initiatives," she said. "Only then can you prioritize the automation and scalability building blocks that create true clinical mobility for clinicians and omnichannel engagement with patients." Also, no health system can absorb all at once the amount of organizational change that's needed to meet all the challenges that exist today, she concluded. "Create the roadmap and pick good partners for the journey," she said. "There will be bumps in the road and you want partners you can rely on." 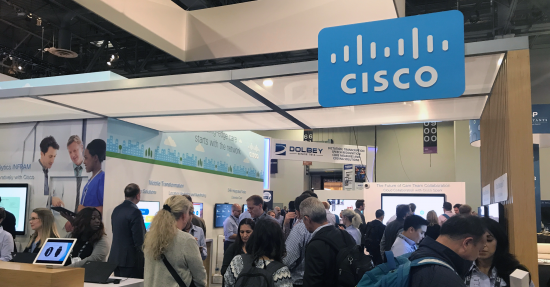 Cisco will be in booth 400-101.